Why Buy A Nature's Comfort Outdoor Wood Furnace? You could save over $60,000 on your heating bills just during the warranty period! With a Nature's Comfort outdoor wood boiler you can finally eliminate those budget-killing heating bills once and for all! Nature's Comfort Outdoor boilers are built to our design specifications by our manufacturing firms in Wisconsin and Indiana. 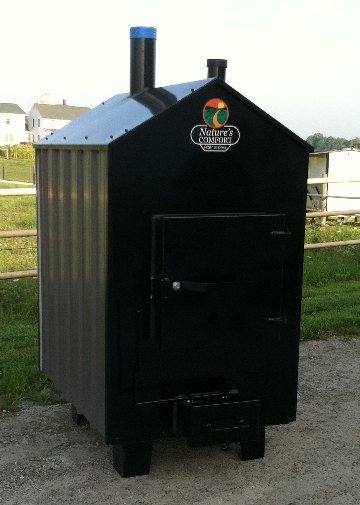 With our design and specifications and the many years of experience our manufacturing firms have, you can be assured you're getting the best outdoor wood boiler made. When you decide to purchase a Nature's Comfort Outdoor Wood Boiler you may go to the link on our home page for Access Equipment Financing... if you qualify, you can get 100% of your purchase financed. Once you've made your purchase, you can expect hassle free shipping. Here are some added incentives... that really make a difference! Firebox is 1/4" or 3/8" thick steel (whichever you choose for an NCB Series 175 or 250) with an opening of 27"x18" to handle large logs. Water jacket is 7 gauge (approx 3/16") on the NCB-175, NCB-250 and NCB-325. And 10 gauge (approx 1/8") on the NCB-120.